It took seven years and one day for Shannon and me to make the decision to quit our jobs, take the boys out of school and fly to Italy. For seven years we’d been trying to live the good life, the kind of life that Matthew Evans glides through on The Gourmet Farmer; the self-sustaining bliss of River Cottage. They make it look easy, but we were rubbish at it. We’d planted an orchard, dug a veggie patch and bought a few chooks, but seven years later the fruit was rotting on the ground, the chooks were dead and the sight of zucchini made me want to scream. We had no time for it. Then one day I had an accident in the car park at work. No one was hurt, but it had happened because I’d been exhausted for months, and because I was stressed and distracted by a thousand little worries all flying around my head. We’d thought we were down-shifting when we left Sydney to live in the Adelaide Hills, but we’d only side-shifted. We brought jobs and study and everything else with us – and then we added a small farm and a long commute. ‘We’re not doing this right,’ I said. ‘No, we’re not,’ he said. We joined Willing Workers on Organic Farms and flew to Italy. If the good life was out there, surely we’d find it in an olive grove in Tuscany. 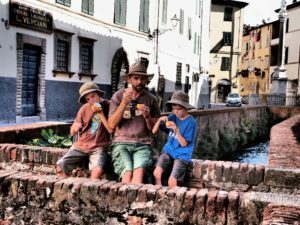 Four months off school and the promise of gelato every day was enough to convince the boys that a working holiday in Italy was a fantastic idea. But before we’d even arrived at our first farm there were signs of dissent. 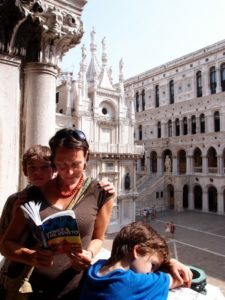 On our first day in Italy, the ancient architecture of Rome captured the boys’ imaginations, but by day two they needed something more tangible to justify the hours of wandering. Without it, they had every intention of spending the day in our hotel room, reading books until their allocated hour of screen time. This is what they looked forward to: an hour searching for Pokémon on a Nintendo DS, exactly the same thing they looked forward to back home. I was disappointed, and Shannon recognised the brewing argument. ‘Did you know that somewhere in Rome you can buy Pokémon flavoured gelato?’ he said. Within minutes we were out on the cobblestones. When a thorough sampling of Roman gelatarias failed to uncover Pokémon gelato, the boys embraced the challenge of travelling the length and breadth of Italy in search of it. Shannon had given them their own reason for being here – while we searched for the good life they would search for Pokémon gelato. Then we arrived at our first farm, high in the Tuscan hills and hours from the nearest gelataria. It was a shock. The farmer walked us up a narrow goat track to a small dank cabin on the edge of the woods. Two single beds and a mattress on the floor filled the small space. There was no toilet or shower, and even more concerning for the boys was the absence of a TV and internet access. But there was a ping pong table and a river with tadpoles and rows of raspberries more delicious than ice cream. Our mornings started with warm porridge heavily drizzled with home-grown honey, and each night we would go to bed at the same time as the boys and send them to sleep with stories from when they were little. It never failed to bring smiles to their drowsy faces. When we embarked on this journey we had romantic notions of the boys accompanying us in the field as we toiled in exchange for our food and accommodation. Of course, the boys were not required to work – kids eat and stay for free, just like they would at a mid-range resort in the Whitsundays – but we thought they would enjoy the opportunity to be outdoors and out of the classroom. It turned out they actually wanted some structure. They tired of tadpolling after a few days and wanted something else to pass the time between breakfast and the long, drawn-out lunch that pretty much took care of the afternoon. That’s when we remembered we’d promised the Department of Education that we would home-school the boys, or at least get them to write regularly in a diary. From then on, they spent time every morning writing about what they’d done the day before, after which they could spend an hour playing Pokémon on their DSs. Of course, when I say an hour, I think we all recognise wishful thinking. We’ve always lost track of screen time, and an hour often stretches to two and sometimes three (I’m not proud), because it’s convenient and brings a rare quiet to the house. I’d hoped to curtail this habit in Italy, and the irony of placating the children with screens while I got things done in the fields was not lost on me. On our precious days off, and during the ‘holidays’ we took between farms, we would resume our search for Pokémon flavoured gelato. At every gelataria the response was confusion and a suggestion that perhaps the boys would like to try the chocolate or fruits of the forest or red onion (yes, really). Of course they enjoyed whatever flavour they chose, but they slowly began to doubt they would ever realise their dream of eating Pokémon gelato. 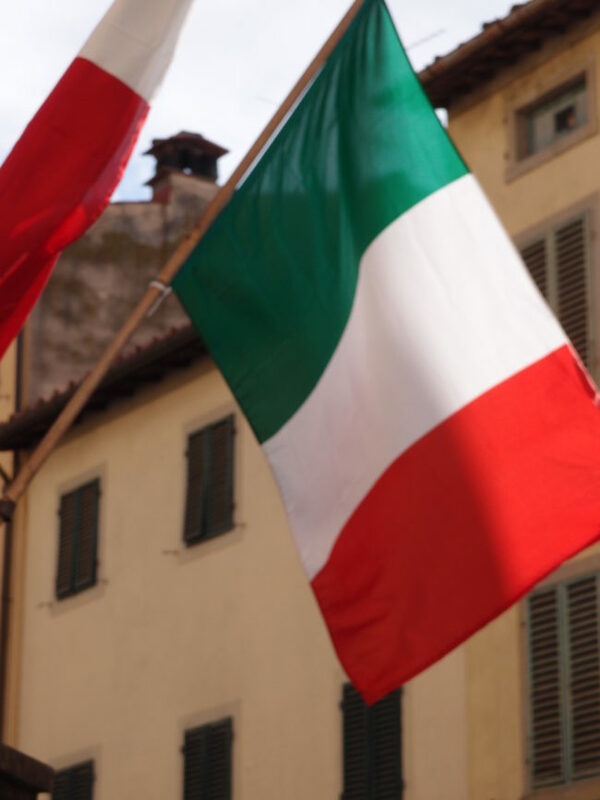 Their whole reason for being in Italy began to look flimsy. They wanted to go home, they said. Let’s just wait and see what the next farm brings, we said. They agreed, reluctantly, and we headed for the hills around Bologna. When we walked into the farmhouse we saw three children sprawled across a large table making Pokémon cards with cardboard and scissors, coloured pencils and a laminating machine. They didn’t speak a word of English, and ours spoke little more of Italian, but they became best friends in the time it took their dad to make us all coffee. 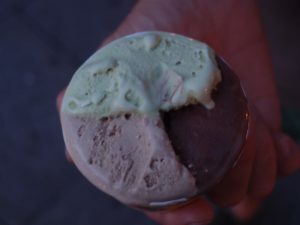 The boys stopped asking to go home, and when we visited a gelataria in Bologna, they completely forgot to ask if they had Pokémon flavour. When it was time to leave, the boys begged to stay.